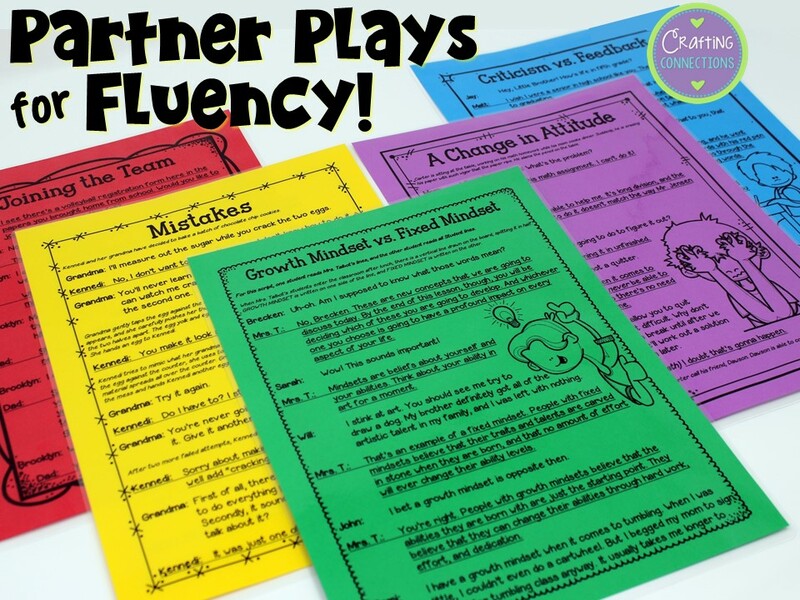 This photo features my Growth Mindset set of partner plays. It is often said that fluency is the bridge between word recognition and reading comprehension. I love the image that statement creates in my mind. I can picture a struggling reader take that first tentative step across the middle of the bridge by experimenting with aspects of fluency, like expression and phrasing. 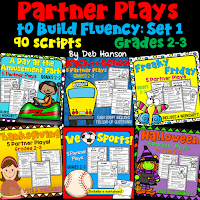 With each repeated reading and fluency activity, the reader reads more smoothly and expressively. Eventually, as the reader gains confidence in his or her ability to read fluently, his or her steps toward reading comprehension become more assured and certain. The time it takes students to cross the "fluency bridge" varies significantly. 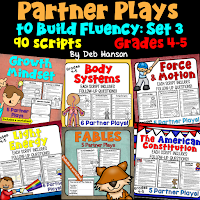 Some students exhibit reading fluency almost immediately upon learning to read. Others improve steadily with regular practice. And some students struggle to acquire reading fluency. Their steps may be much smaller than their peers, but with repeated readings that target fluency, they will cross the bridge. Luckily for us teachers, there are plenty of fluency activities to choose from: reading poetry, reading with audio recordings, choral reading, echo reading, and paired reading are just a few. Personally, my favorite is paired reading. 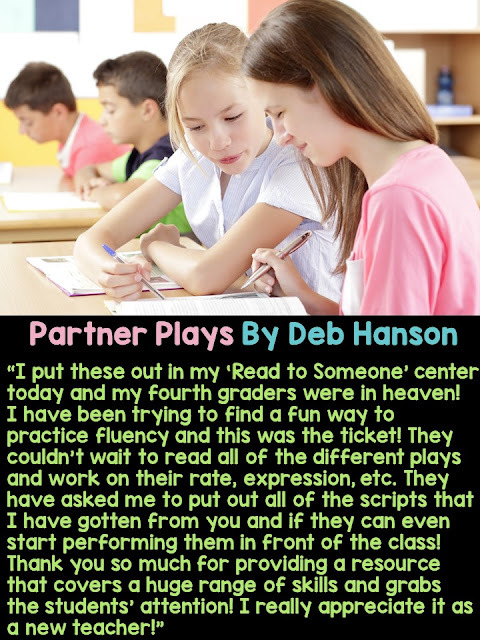 After all, students are often begging to work with partners! 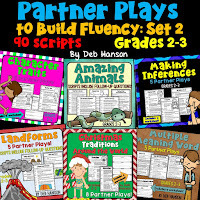 Plus, if you plan your partnerships in a purposeful way so that a student who exhibits reading fluency is paired with a student who needs improvement in the area of fluency, that struggling reader will be exposed to fluent reading in a very natural way. 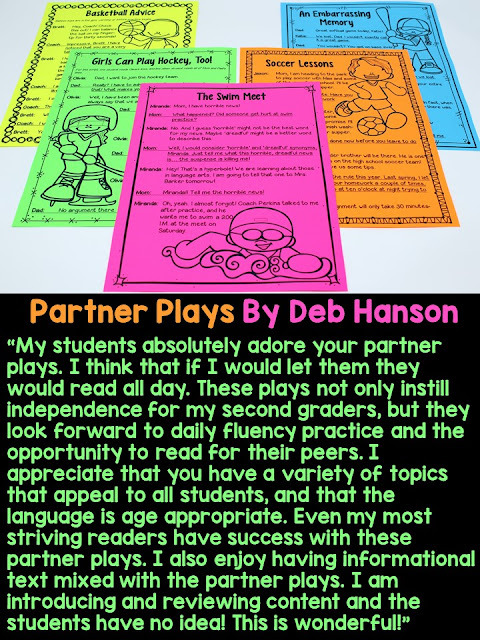 A few years ago, I started to create partner plays for the 3rd, 4th, and 5th grade students I was working with. 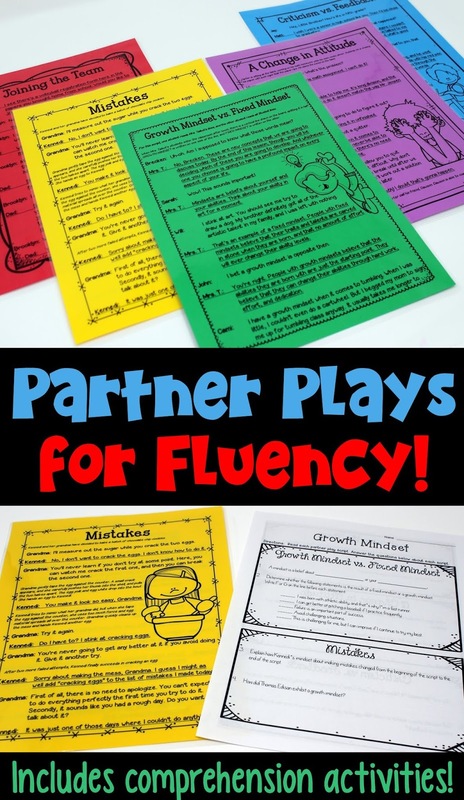 My primary purpose for creating the partner plays was to target reading fluency. 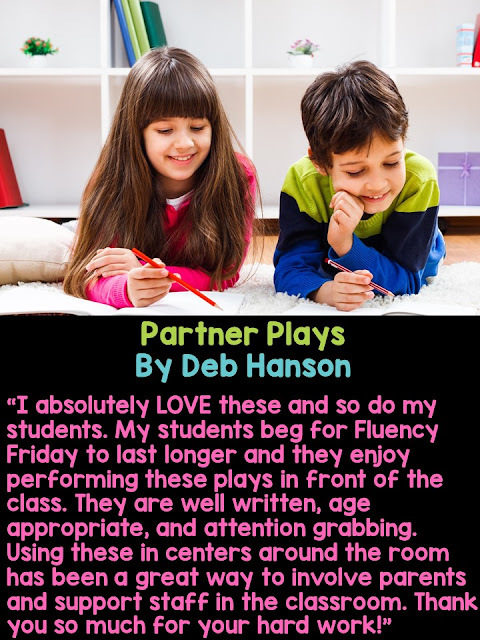 When I introduced my students to the plays, I was thrilled to find out that they LOVED the scripts. They were constantly imploring me to write more and more scripts, which I did. Eventually, I decided that I wanted to add a comprehension component to each script. 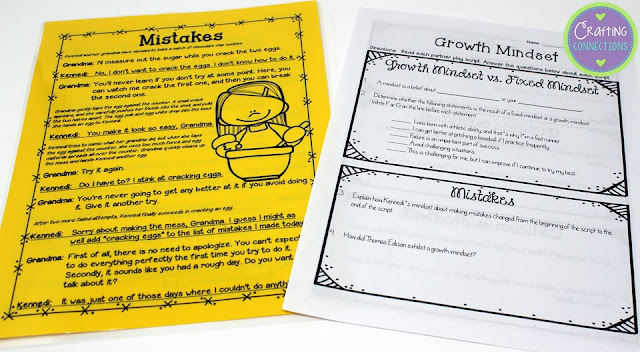 After students read a script, they answer the comprehension questions that accompany it. Comprehension questions accompany each script. Over the years, I've written nearly 100 sets of scripts! I'm including links to a small handful of scripts below, but if you'd like to see the complete list of plays available just click HERE. CLICK ON EACH BUTTON TO PREVIEW EACH SET OF SCRIPTS! Each set of scripts can also be purchased individually. 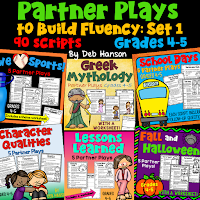 Click on the buttons below to preview individual sets of partner play scripts. 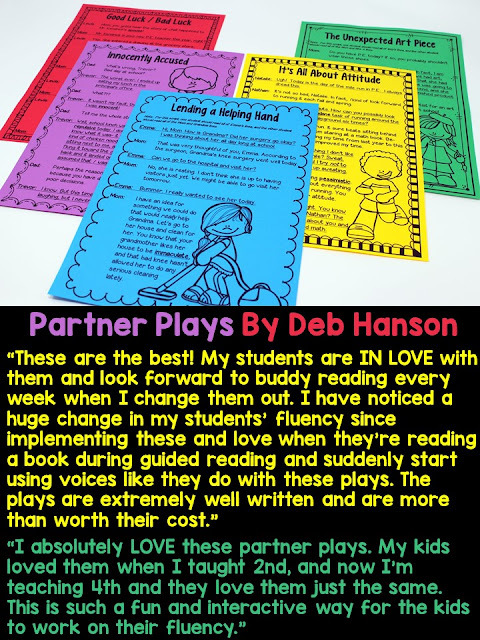 READ WHAT OTHER TEACHERS ARE SAYING ABOUT THESE PARTNER PLAYS! 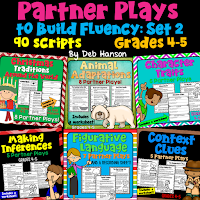 Finally, you might want to check out my four free partner play scripts and my free fluency posters. 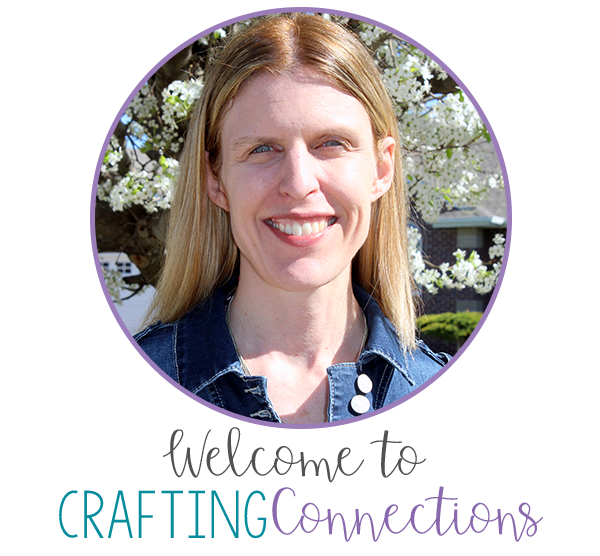 You will find links to those items by clicking on this blog post.